PLEASE CHECK OUR FACEBOOK PAGE FOR THE CURRENT LIST OF WHAT WE ARE NOT TAKING FOR THE WEEK AND TO MAKE SURE WE ARE TAKING TRADES. Children’s Trading Post is a children’s resale store located in Lakewood on Gravelly Lake Drive across from Clover Park High School. The owner started Children’s Trading Post with the idea of an affordable, clean and fun store that she would want to shop at. We have grown from 500 square feet to 2,500 square feet of gently used clothing, equipment, and toys. We also carry a few new items like Lillebaby and Kinderpack carriers, WubbaNub Pacifiers, Hair Bows, Bath Squirters, Puzzles, Momma Goose Amber Necklaces, Love at First Bite Chewlery, and Cosco Comvertible Car Seats! We strive to keep our prices low and quality good in order to offer you the best values possible. We offer in-store credit and cash for items that are brought in for trade. 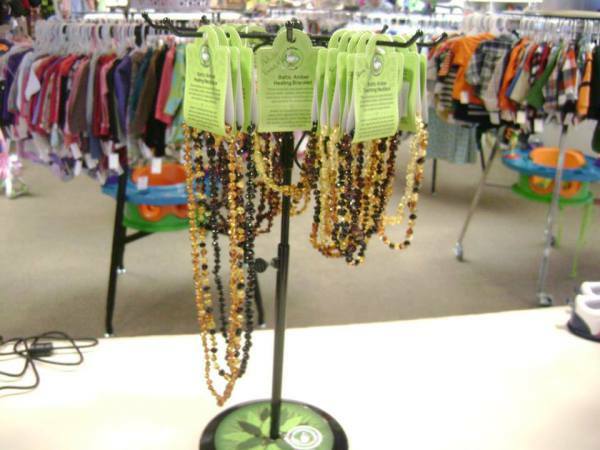 Baltic amber teething necklaces for your little ones and we even carry adult jewelry for mom's and dad's as well. We have a wide range of baby equipment for all your needs. We sell gently used clothing and shoes ranging in sizes from preemie up to size 10 years.